PM Modi who is currently in the UK discussing international relations and to attend the Commonwealth Heads of Government meetings. Prime Minister Narendra Modi on a visit to the UK and hosted by Queen Elizabeth II at the Buckingham Palace on Thursday, April 19. PM Modi in the three years following his UK visit he met twice Queen Elizabeth. This was his second meet, he earlier met Queen last year in November 2017. PM Modi was welcomed by Prince Charles at "Illuminating India: 5,000 Years of Science and Innovation" at the Science Museum here. PM Modi met Queen at Buckingham Palace before the Bharat Ki Baat, Sabke Saath' event. which was telecasted live from the iconic Central Hall Westminster in London. This was Modi's second official visit to Britain. The Prime Minister’s official Twitter handle posted a picture of Modi with the Queen. In no time the tweet gets flooded with hilarious comments from Twitterati. Modi: I have arrived. I have come to teach the world about direct democracy! Modi ji: I shall use your country as a grand venue to address my citizens back in India! 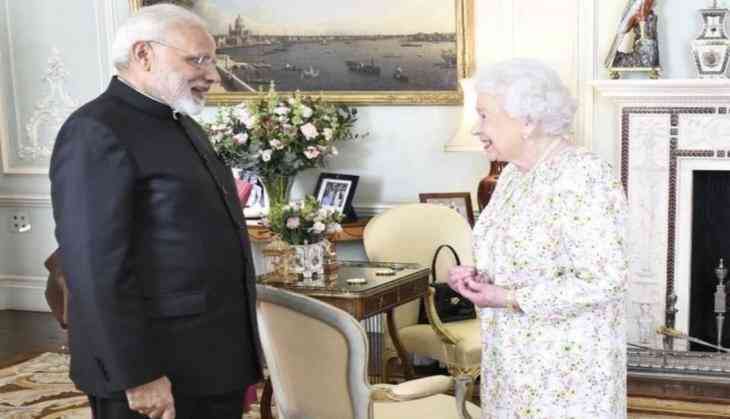 Queen: Tell me something I don't know..
Modi: You have something that belongs to us. Modi : Arey aap vo titanic waali ko kya ? Queen : haan meri painting banaoge ?